Another way in which Art and Science come together is in books about photography. And what does any self-respecting photography book include? 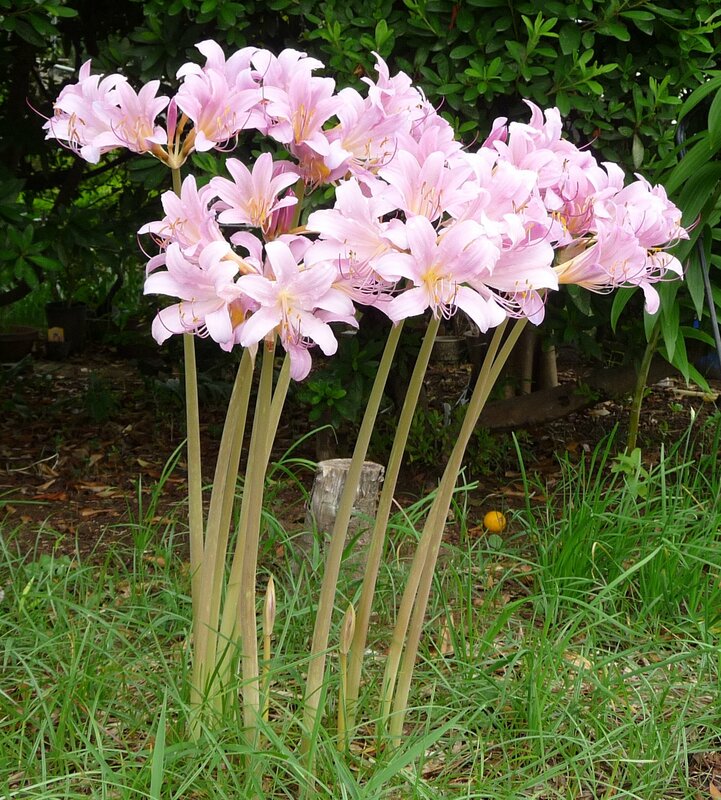 Pictures of naked ladies. Actually, it often doesn’t include pictures of naked ladies any longer, because they have all been stolen. It’s like an epidemic. Except that the illness occurred decades ago and we are only now discovering the casualties. Also, I’m not going to be including pictures of any naked humans in this blogpost, so don’t get all excited. Someone really needed that article for their research paper and the book could not be checked out. Someone really disagreed with that article and didn’t want anyone else in the world to read it. The book is old. The adhesive on the spine dried up. Some pages just fell out. Pet chinchilla ate the pages. Someone forgot to bring money for the photocopier. Photocopiers hadn’t been invented yet. Someone had a really bad cold and forgot their pocket handkerchief. That chart/map/table is just very useful to have on hand. That picture is really pretty and someone wanted to put it on the wall in their dorm room. That picture is of a naked lady . Ok – let’s be clear here. Some of these things still happen, but many of these problems occurred in the past and are just coming to light now. When you have the font of all human knowledge AND a camera on the device in your pocket, you don’t really need to steal knowledge or images from the library any more. But sometimes pets do get out of hand. Books are continuing to age. Pages still legitimately fall out and get lost. Sometimes. But thefts perpetrated in decades past seem to be the most common reason for missing pages. 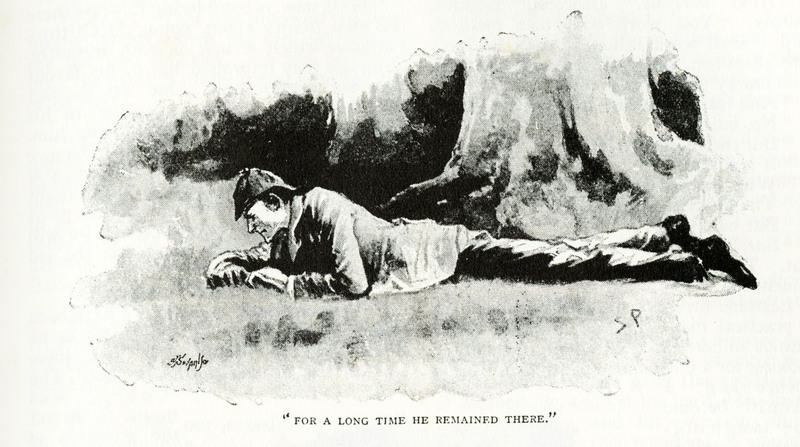 Tracking down missing pages is a bit like traveling into the past. You start to question the motivations of the person who took the pages. In most cases, you feel that someone just thought a picture was so lovely that they wanted to frame it and hang it on a wall. So they got a pair of scissors and hacked that sucker right out of the book and went on their merry way. I expect this does still happen occasionally. But it is now more likely that you would just Google image search that thing and then print your own copy. Or make it the wallpaper on your phone. We won’t even go into how weird if feels for me to talk about phones having wallpaper. Let us take just a moment to think of the images that are on the other side of the picture of the naked lady. 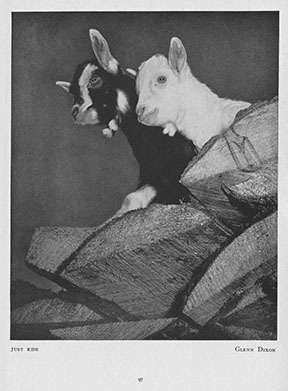 These baby goats, for example. Think about all of the people who have been unable to appreciate this cuteness because someone just had to have the naked lady on the other side of the page. Or, possibly, there is actually important text on the reverse and someone might now be missing a critical piece of information. In some cases, the loss is too devastating for us to do anything about it. If the book is still in print, or readily available digitally, we might suggest to the subject librarian that the whole book be replaced. Sometimes, it simply isn’t worth our time to replace pages. But in many cases, the books are not so easy to come by, or would be perfectly all right if that one missing page were replaced. In these cases, I will go page hunting. STEP 1: Figure out that there are pages missing from a book. 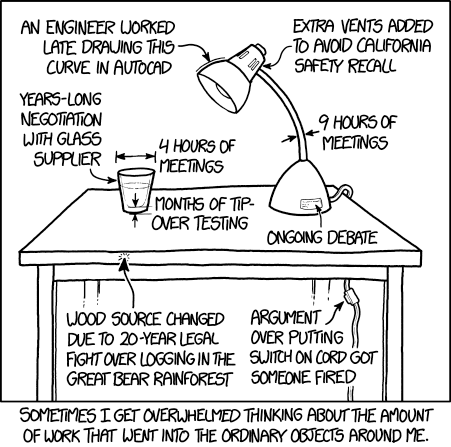 This can happen when we do our first review of an item as it comes into the lab. Often, library staff or patrons discover that pages are missing and send the book on to us. This is most often noticed when someone sees sad stubs of pages that have been torn out. STEP 2: Go through the rest of the volume to make sure that there are no other, previously unnoticed empty spaces. There very often are. Especially in books of photography. Extra especially in books of photography that include photographs of naked ladies. 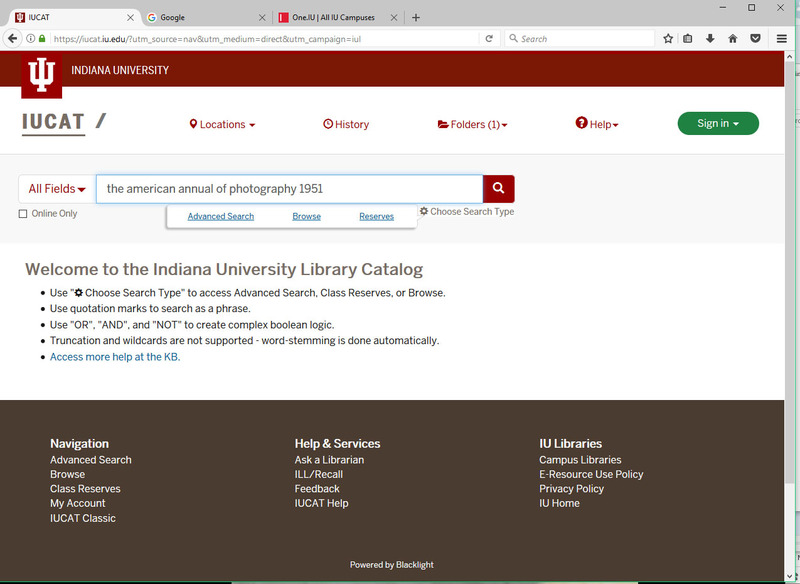 STEP 3: Once you know exactly what is missing, look the book up on IUCAT to see if IU owns other copies of the book. Nope, not that IU Cat. If you are very lucky, then the book is out of copyright and available on Hathi Trust. If you are very unlucky, the book is a bound copy of a popular periodical (Life magazine for example) with poor page numbering and no clear article breaks. It is difficult to place an interlibrary loan request (see Step 4) when you can’t specify which pages you need. 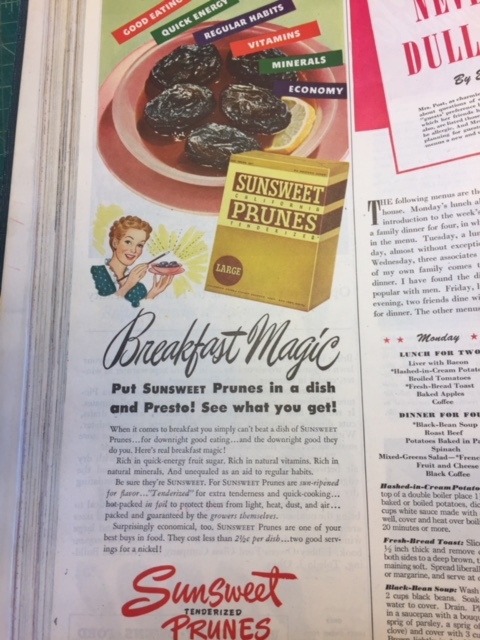 Sadly, people love to take old magazine advertisements. I get it. Sometimes they are hilarious. And don’t have numbered pages. STEP 4: Based on the availability of other copies of the book, make a determination of the best way to get a hold of another copy of the same edition of the book, and request that a copy be sent to you. This is my chance to point out that I am not the only staff member involved in this endeavor. I have to work very closely with the staff in Document Delivery Services to solve these problems. -Either go to the library to find the book on the shelf, or request delivery through campus mail. A copy is owned by a library at another IU campus. -Put in a delivery request through IUCAT to have the book sent through inter-campus mail. -Put in an interlibrary loan request through Document Delivery Services. 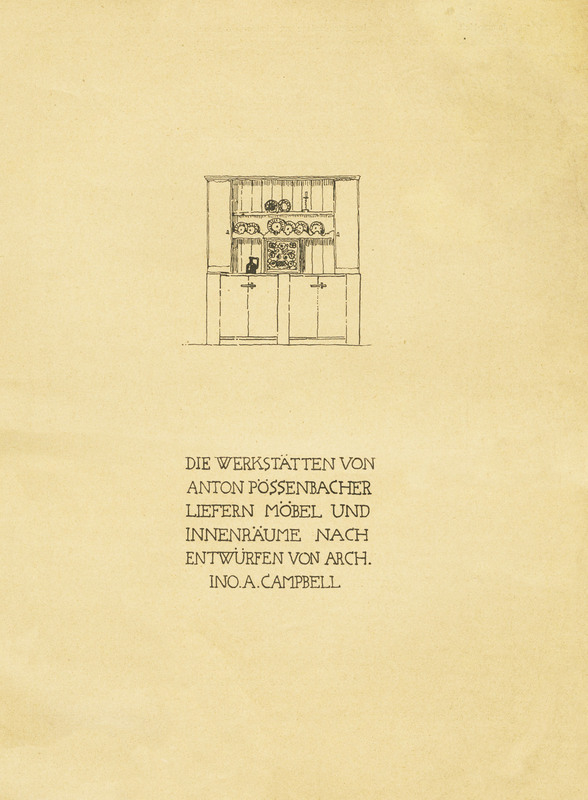 -Hope very hard that the pages you need are not also missing from the online copy. If they are there, celebrate, and download the relevant pages. Skip to Step 8. 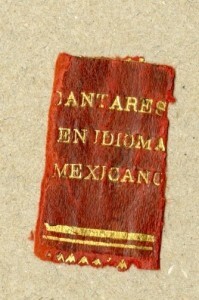 The book is a periodical. -Document Delivery Services to the rescue again. In many cases, one can request electronic copies of specific pages. This is a lifesaver when it works. It is heartbreaking when the library at the other end sends the wrong thing and you have to bother the DDS people again. There are no other copies available anywhere. -You are out of luck and there are no options left, because drawing your own replacement pictures or writing your own replacement text is not an appropriate option. STEP 5: WAIT. The folks at Document Delivery Services will work all of the magic that they can to get you what you need. They are amazing and fabulous and friendly and helpful and deserve all of the superlatives. STEP 6: Receive the other copy of the book you need. Compare the copies to make sure that the editions are the same, and to see if the pages you need are in this copy. Understand that if you are looking for missing naked lady pictures, 80% of the time the same pages will be missing from the copy from the lending library. If this is the case, contact the DDS folks and start the whole request process over again. Repeat as necessary. Sometimes this can go on for long time, getting one page from the University of Michigan copy and another page from the Purdue copy, etc. 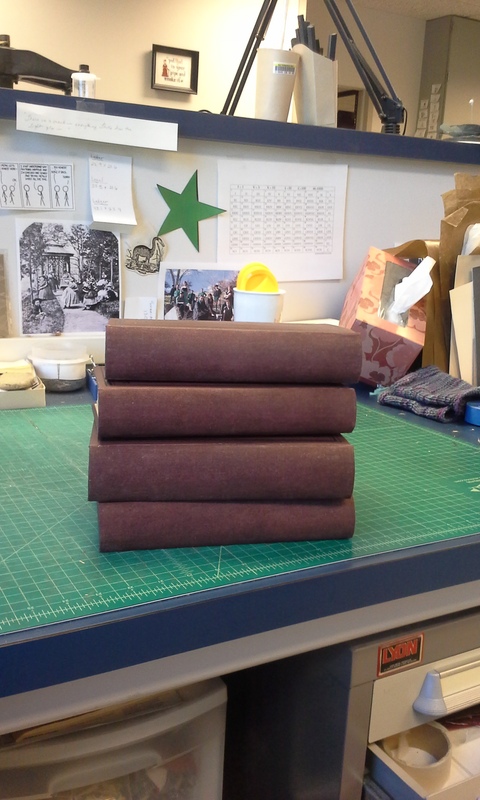 STEP 9: Attach the copies into the original book. 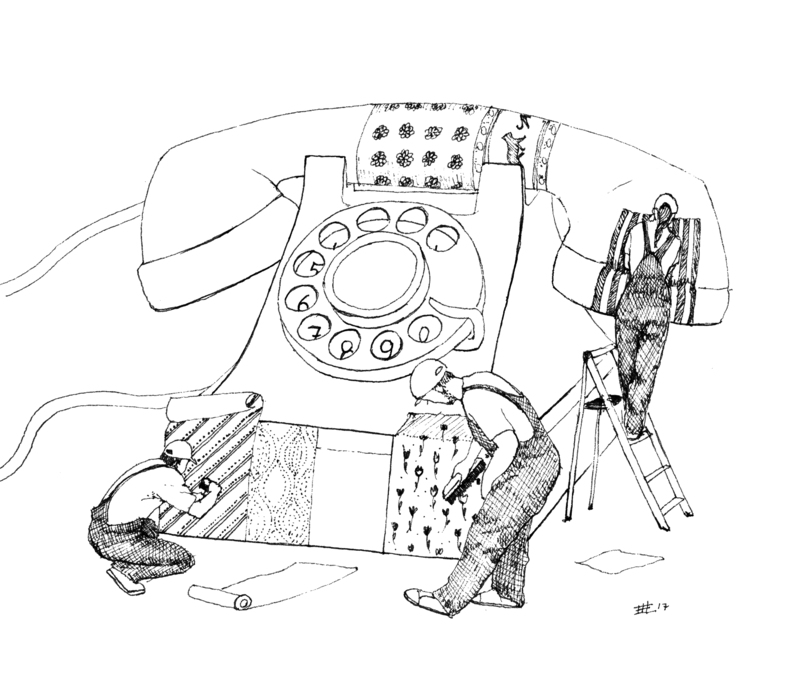 Additional repairs will often be needed at this point, so take care of those as well. STEP 10: Send the book back out into the world with beautiful new pages and hope to goodness that they don’t just get ripped back out again. Ready to be sent home! Ok – After laying that all out, I guess my point is that this process is not quick. 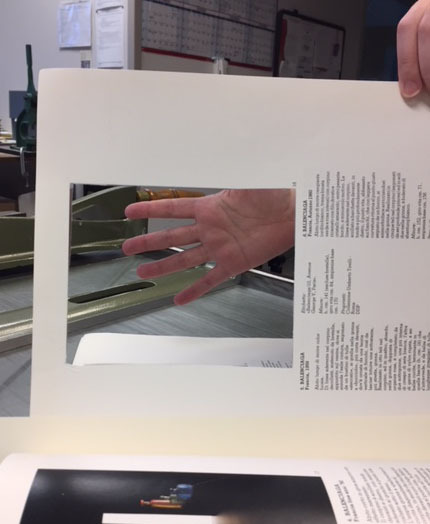 As with all of the other books that we handle, books with missing pages present a unique set of problems, and must be evaluated and dealt with individually. Books with missing pages take a lot more thought and care and work than many other books that we care for. We love all of our books and will do our best for each of them. 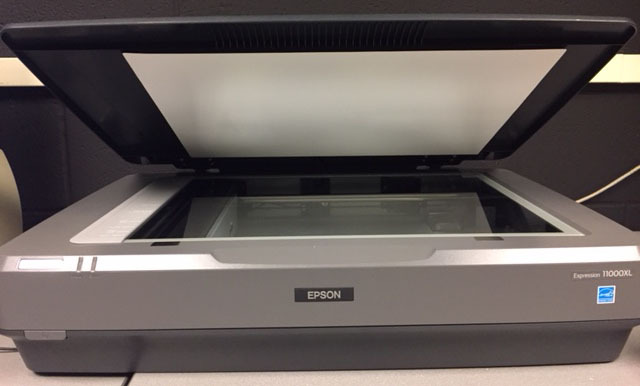 But for goodness sake, if you really, really need that picture, take a trip over to the digitization lab and scan yourself a copy. Or just take a photo of it with your phone. The folks at Document Delivery Services will thank you. And so will I. I’m tired of looking at naked ladies. I have a fondness for old textbooks, so it was nice to have a chance to help this one out. It was a pretty straightforward repair. Some hinging of pages and a reback with a Japanese tissue/linen laminate. But here’s the thing that really grabbed me about the book. It smelled of wood smoke. Not that familiar, musty, foxed, sat-in-the-stacks for 100 years smell. Fireplace smell. I realize that the smell is probably because this little book survived the IU Library fires in 1969. You can read a nice history of those two fires, as well as other significant IU campus fires in a recent blog post from the IU archive. At the lab, we often see books with their top page edges blackened, and we generally assume that they are survivors from the 1969 fires. But this nicely smelling book didn’t make me think of destruction and student unrest. I grew up in a house that was heated with a wood stove. It smelled like home. Or like the house of a friend where sometimes we sit by the fireplace and read poetry. And I imagined young people in the late 1800s sitting at a table by the fireplace working studiously on their arithmetic lessons. There are so many ways that books connect and transport us. Mostly, we think of being transported by the stories they tell. 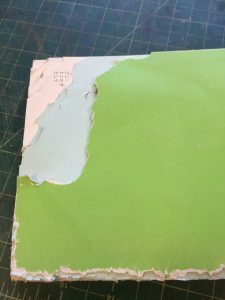 But with a bit of imagination, books can also bring us into contact with the craftspeople who made them, the people who owned and handled them, and sometimes, the rodents who chewed them up. Sigh. I probably still have mouse DNA on my hands from that one…. 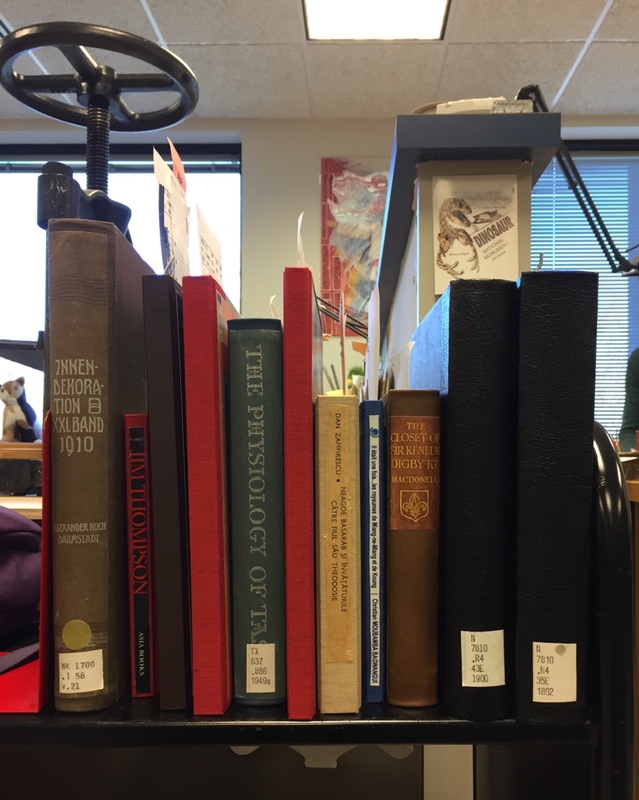 In the General Collections Conservation unit, we don’t come across many very old books, but every now and then one will stumble into the lab. In the last months, we’ve had a couple of these that were just hanging out in the stacks waiting for someone to care about them. 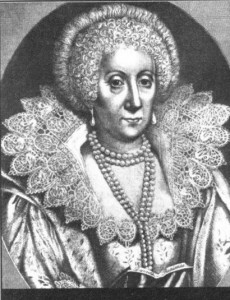 One is dated 1592. The other is from 1638. I’m a Bloomington native, so every now and then someone in my family will stop by the lab to drop off homemade bread or pick up a bag of potholders or something. Elise is always happy to show off the amazing things she is working on and my Mom happened to come by on the day she was working on the book shown above. My mother was duly and volubly impressed and that evening I got a call from my Dad. Might he please come in and see the very old book as well? Of course! We love to share the coolness. Dad showed up the next day. He took a lot of pictures and asked a lot of questions. We even let him hold the book, although like many lab guests, he was a little afraid to do so. I felt like I could see right through his skull into his brain where all of the tumblers and gears were whirring and clicking along. We went out to lunch and talked about how old items connect us to the past. What can we learn about artists and craftspeople by holding their work in our hands? 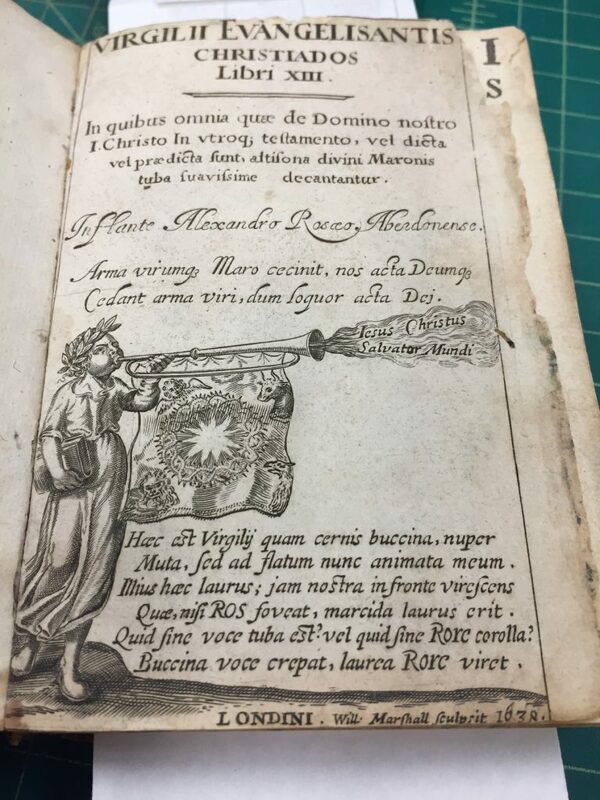 Someone spent hours upon hours of time setting the elaborate type for the book. And who was it that stitched it together? Treated the leather for the cover? How many young people sat at a table by the fireplace studying it? How many fires has it survived? How often do we really think about the design of our water glass? How often did the child studying that arithmetic book think about its binding? Probably, not often at all. Perhaps never. 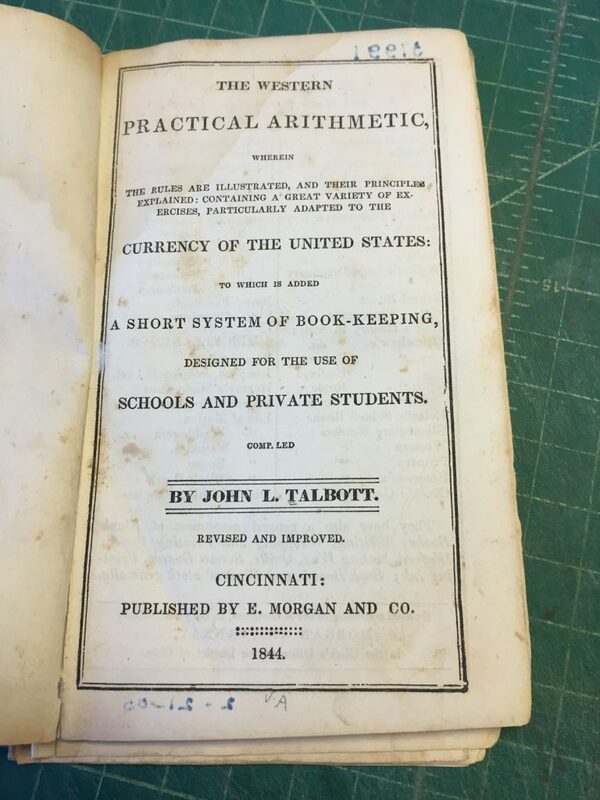 Yet, now, we here in the Preservation Lab are fascinated with the old arithmetic book, and of course the older, and therefore more precious books as well. In 172 years, someone will probably be fascinated with our water glasses. And our e-readers. I was pretty certain that my poet father was going to end up writing something about very old books. And he is far more eloquent than I am, so I waited to see what would come of my dad meeting that book and by extension all of the people who, step by step, brought it to us here. Stiff, when I opened it. that rested on my hand. 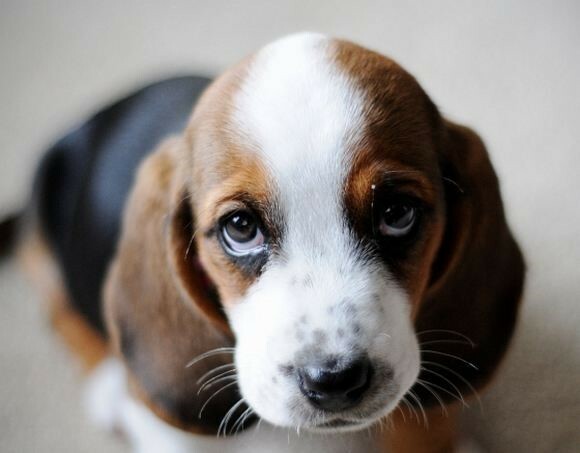 Stop staring at me, melancholic puppy! 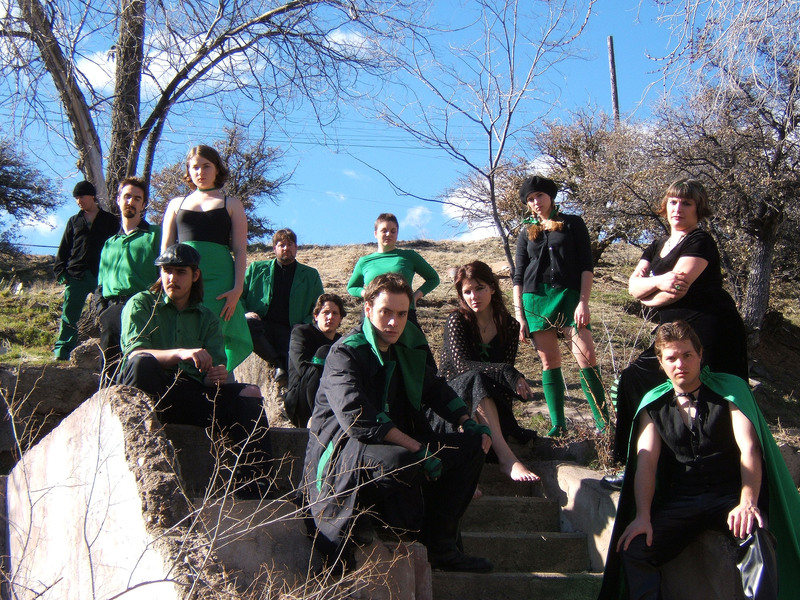 Part of my hang up is that I used to be in a Shakespearean improv troupe. 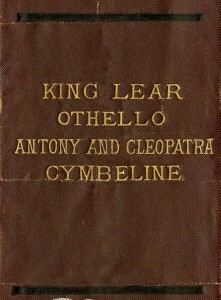 We were called the World’s Greatest Shakespeare Company. No kidding. The whole thing was beautiful and dark and deeply important to me. It dissolved by slow degrees a couple of years after I left to learn how to save books. I never really got over it. 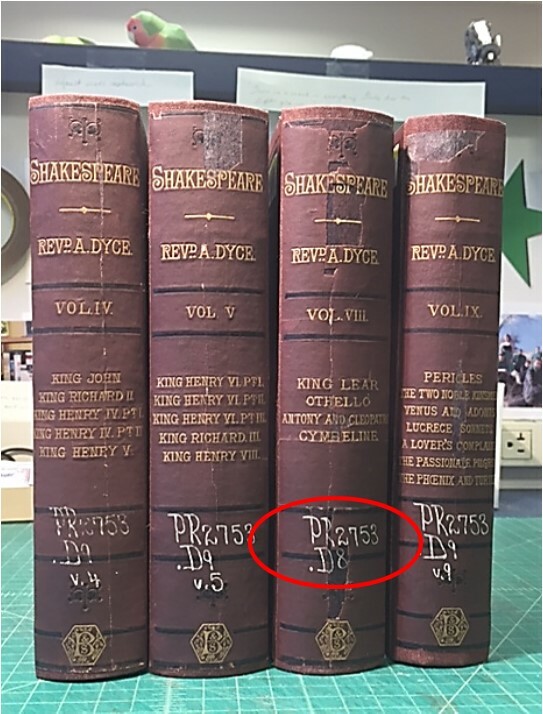 So I always try to grab the Shakespeare books when they come through for repair. It’s like I owe Shakespeare something. But added to that compulsion, was the death of one of my fellow cast members. David was the handsome, brooding, Byronic hero type in the foreground of the above photo. He was the heart of our group. I did what you do in these cases. I flew to Arizona to sit stunned in a bar while the rest of the cast told funny stories. And then I flew home and didn’t feel very much better about it. I grabbed them and hung on for dear life. The books themselves aren’t so terribly special or rare. But I have this thing about Shakespeare. So I decided that I needed to pour everything into them. It would make me feel better. Work and therapy in one neat (well, actually pretty messy) package. 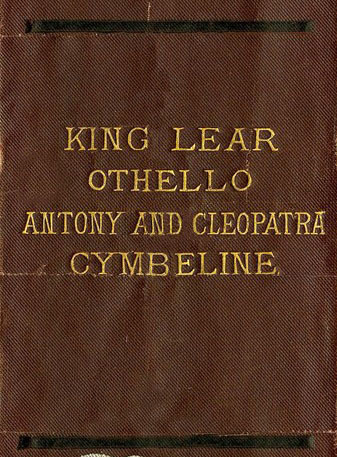 The book is well written and convincing, so I had spent some time reading up on other aspects of the Shakespearean authorship question. And was left wondering who really wrote these books that I was working on. My brain got sort of tangled up. 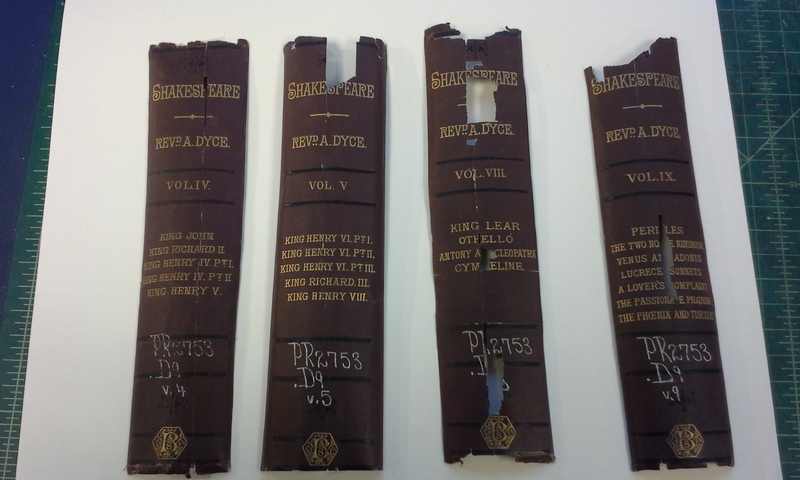 So there I am listening to Shakespearean Authorship Question podcasts and fussing over how best to repair these poor books. I don’t like to get too heavily into metaphor. That’s why I couldn’t bear to be an English major. But regardless who wrote them, I had certainly given these books more weight in my life than I would have if they had showed up a couple of months earlier. 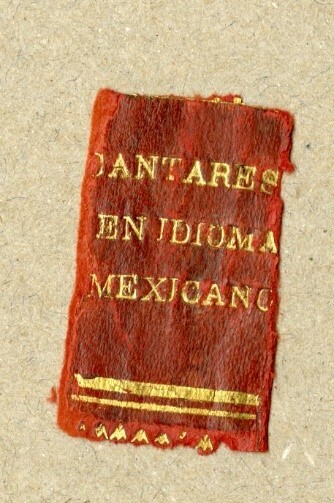 The text blocks were in very good shape, but the spines were badly deteriorated. So rebacking and spine repair seemed the way to go. The rebacking went smoothly, and I was able to get a good color match on the linen and Japanese tissue laminate. So far, so good. Often, when book spines are pretty but deteriorated, I will scan them, clean up and repair the image in Photoshop and then just mount a printout of the repaired image in place of the original spine. 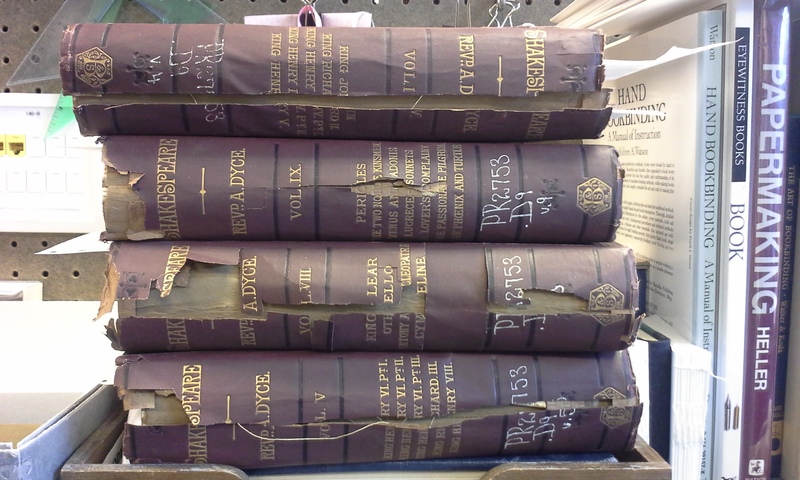 In the case of the Shakespeare books, though, I was determined to save as much of the original spines as I could. 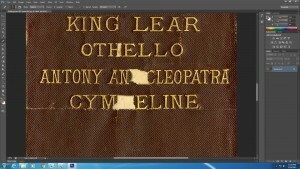 The cloth was workable, but the problem was that chunks of title were missing. So I decided to try to recreate just those parts to fill in the empty spaces. 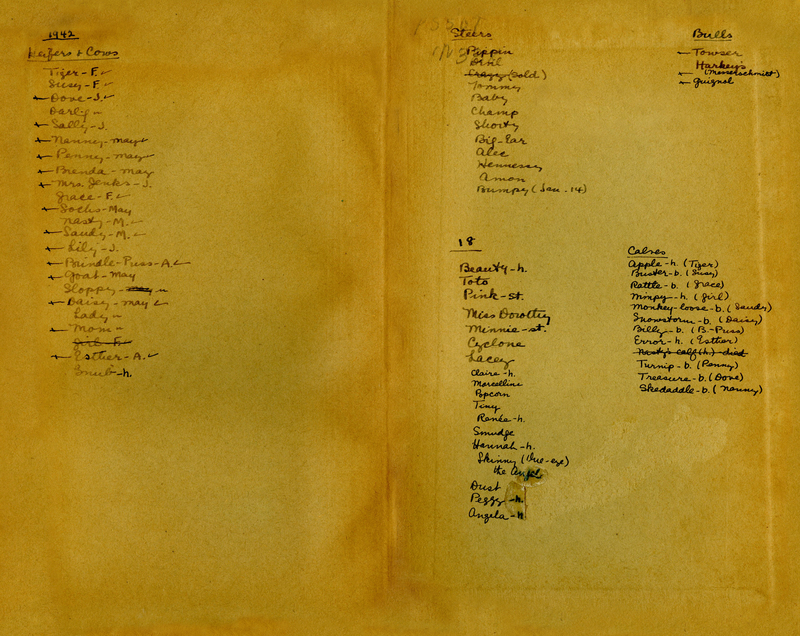 First, I temporarily taped the worst bits together and scanned them on our flatbed scanner. My idea was that I could cut and paste bits from the more complete spines onto missing parts. I would print patches onto Japanese tissue and then paste them on to the missing areas. I had never tried printing on Japanese tissue before, and wasn’t sure how it would work. 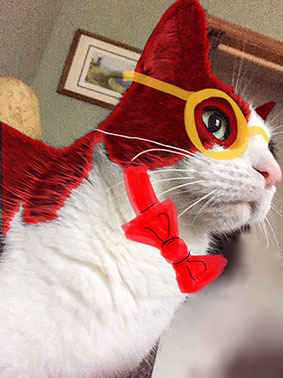 Plus, I figured it was going to test the limits of my Photoshop skills. New technique! Challenge! Therapy! And stage one worked pretty well. I was able to get a nice clean scan of all four spine pieces. 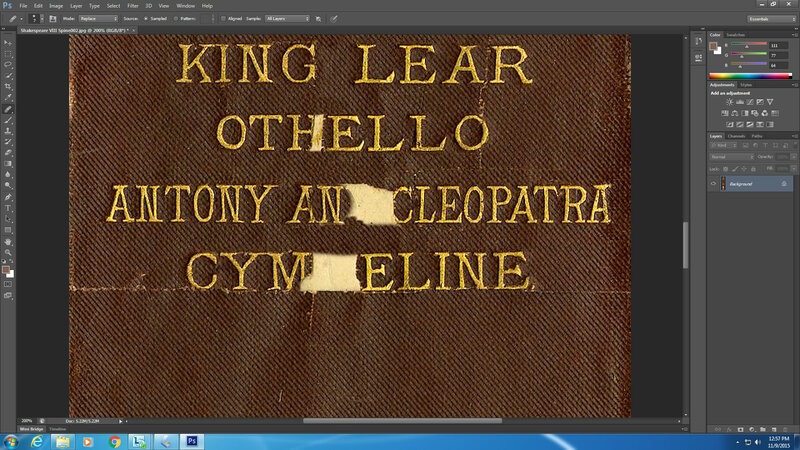 At this point I started the fiddly process of recreating the missing bits of text. If the letter appeared elsewhere, I tried to copy it and paste the image of the letter into the missing area. Sometimes there wasn’t an exact correlation and so I would just try to find a letter that was close and modify it by hand. For example, an “O” can become a “C” just by editing out a few pixels. There wasn’t a lot of this that needed to be done, and I was able to recreate the lists of play titles without too much trouble. It took some more fiddling to get the printed color to match the book covers and some very stern conversations with the printer to convince it that a medium-weight Japanese tissue could be printed on without jamming. Eventually, the printer and I got it right. I was able to mend the broken pieces of spine from the back using a lightweight tissue and fairly thick wheat starch paste. Too much water would have bled through and caused the color to run or smear off. Then, again from the back, I pasted the printed Japanese tissue into place to fill out the missing information or design elements. Once that was dry, I mounted the spines back onto the books. And then I made a mistake. They dried beautifully, but I thought it might be a good idea to brush a little paste over the front of the printed areas to make sure they were really sticking nicely. And that completely clouded over the images. But since the spines were already attached to the books, there wasn’t a lot to do about it. Lesson learned. If it looks good – leave it alone. In spite of my improper use of paste, I was basically happy with the result and ready to give the books a big (but sort of sad) hug and send them on their way. And then I saw my other mistake. Back when the books were accessioned (1948, if the notation on the title pages is correct) someone had carefully hand lettered the call numbers onto the spines in white ink. I was really quite proud of my recreation of the call number on Volume 8. Except that I put on the wrong call number. The last two figures should be D9, followed by v.8. Well crap. But I need to make it right. I’ve been hoarding these books for far too long to send them back out into the world with a mistake like that. Not to mention best practices and so on. So I think I will try to make a new Japanese tissue patch with the correct call number and paste it over my mistake. And maybe a bit of paint over those cloudy areas. My mother is fond of saying “The perfect is the enemy of the good. And the done.” But these books have been with me for such a long time now, and I have given them so much weight of meaning that it will be hard so send them on. I have spent quite a bit of time this week cleaning my workbench. 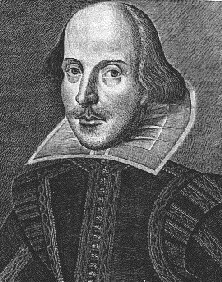 And last Saturday (April 23, 2016) has been widely celebrated as the 400th anniversary of Shakespeare’s death. So I guess now it’s time to get to work. People write in books. Sometimes this is infuriating. Sometimes it is beautiful. Or hilarious. I have particularly enjoyed the deeply opinionated notations made by music students in instructional texts. Recently, I found someone had seemingly written all of her class notes on the end sheets of Henry the Fourth Part I. I love it when bored students have doodled in the margins of their textbooks. It’s a list of someone’s cows. 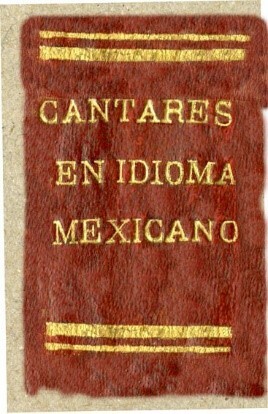 It was written on the back end sheets of a 1930’s collection of essays titled Americans Abroad. 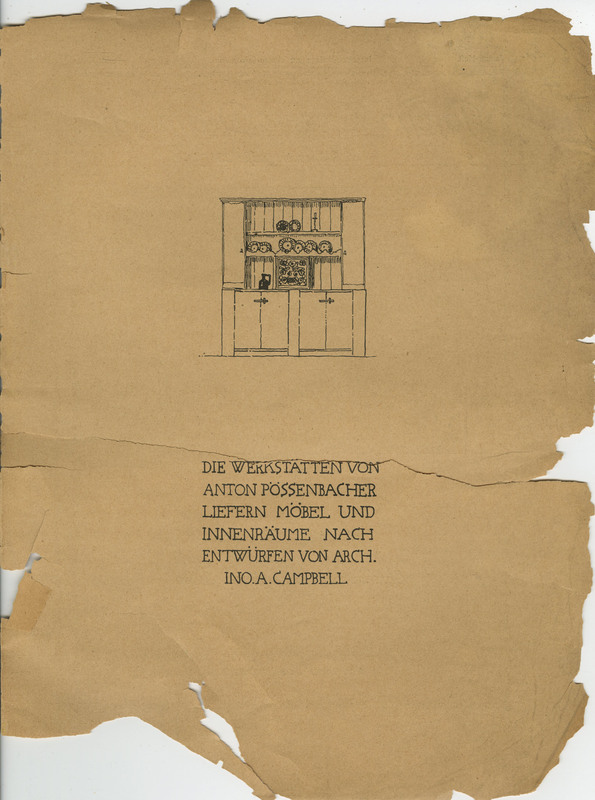 The book needed to be rebound to be useable, and the end sheets were so acidic and brittle, that in the end we made a scanned copy and tipped that into the new binding, just for the sake of interest. Which made me think. Who are the cows in literature? I can really think of only a couple. 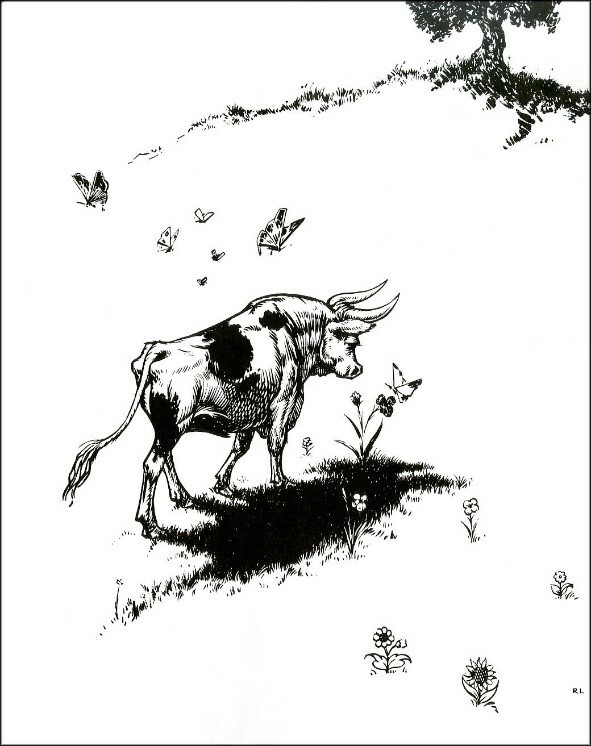 First, my dear childhood friend Ferdinand the Bull, from Munro Leaf’s The Story of Ferdinand, who gave me my first exposure to the idea of nonviolent resistance and the great importance of just sitting and smelling the flowers. 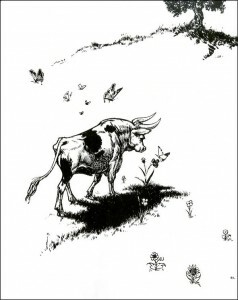 If the number of Ferdinand tattoos out there is any indication, lots and lots of other folks really love Ferdinand. Seriously. Do a quick Google image search of “Ferdinand tattoos”. I had no idea. They let the cow set her own pace, going home, and it was a slow journey but very eventful with Micah and Obadiah and Shadrach running in circles about her, Jabez discovering from the rear that a cow’s tail is not to be hung upon, and Sheby walking gravely by Gideon’s side and weaving a wreath of asters. It kept falling apart in her hands but, for such a cow, even Sheby could be patient. There were five shouts from outside, chiming like bells. Someone cried, “Dorrie! Come quick, cow’s bedded,” and Dorrie ran to the door. Micah was first and caught her hand, and flew her to she shed. “She’ll get up,” he panted, “if we don’t hurry,” and then they were all at the shed and he thrust her through the doorway ahead of him, and sure enough, cow was bedded. The cow seemed very surprised about it and well she might, for it had taken the strength of all the Briggses to make her lie down and appreciate her new comfort. She was a passive cow but she was also used to keeping her own hours, and this daylight bedding was new to her. Still, the hands were gentle, and the hay smelled of clover and one place was very like another. 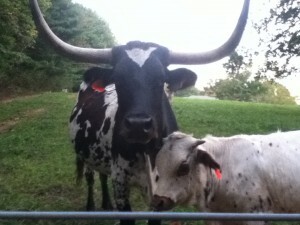 Ok – that’s only two cows. And I couldn’t think of any more. So – off to Google. And it turns out that cows are shockingly underrepresented in literature. Other than a handful of comic books and cartoons, there just aren’t many fictional cows outside of the realm of mythology and religion. 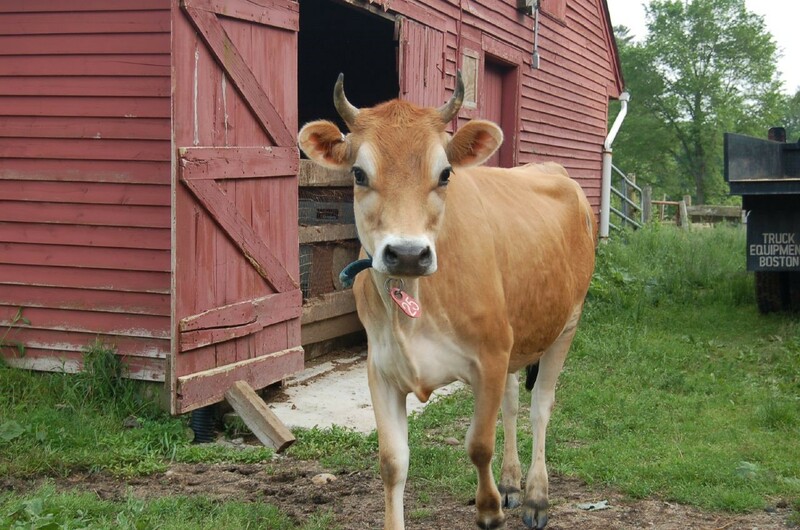 There are deeply significant cows in Greek and Egyptian mythology and of course, Hinduism. I’m not a religious studies or art history expert, but the images are amazing. I’m not even going to try to select any to post here. I just recommend spending some time with the linked pictures. 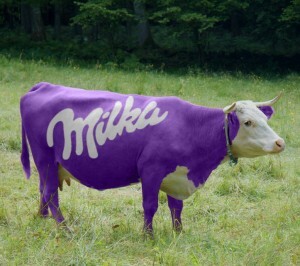 The Milka Cow. Mascot of Milka Chocolate. Like most others of my generation, I was taught never, never to write in books. As a teenager I was furious when my little brother went through my copy of Winnie the Pooh and colored in all of the pictures of Piglet with orange marker and blue ballpoint. And long before my job was in preservation I thought it would be a good idea to remove the ink with bleach. I know better now. And now I love it when a written-in book comes across my workbench. It makes me feel closer to the book to know that someone thought enough of it to comment on it. Or keep their list of cows on the back end sheets. Often when I tell someone what I do for a living, they sheepishly admit that they write in their books and assume that I must hate them for it. Nope. No judgement. Write on! Well, maybe not in the library books. I didn’t tell you to do that. But I won’t be the one to erase it. And I should mention the Book Traces project, which celebrates library books that are written in, or have odd bits and pieces left in them. 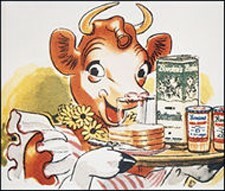 Anyway, I’m sure I missed some important fictional cows. What can anyone out there recommend in the way of cow-related reading? Winter is coming and I want to curl up in a chair with a cup of tea and a book and maybe spend some time contemplating my cow neighbors. And I will smugly point out to my urban Texan relations, that I may live in Indiana, but I am the only one in the family with Longhorns right next door. Posted on September 30, 2015 October 8, 2015 by Author Lara Tokarski Posted in Categories Uncategorized | 1 Comment on Cows! Neuroscience is a very big deal right now. And I spend a lot of my workday plugged into podcasts like Radiolab and Stuff to Blow Your Mind. So although I really know nothing substantive about why my brain works the way it does, when I see faces in random objects, I understand enough to know that it isn’t magic. It’s just my brain. All of our brains. This tricky phenomenon is called pareidolia. Basically, it means that our brains try to create familiar patterns in random or vague stimuli. For humans, faces are one of the most common patterns out there, so we see faces in just about everything. There are all manner of articles on this and no end of cute photos available on the internet. This July 2014 BBC article is informative and also contains some amusing pictures. …I also have this puppy encouraging me during my T’ai Chi class. And, like many folks, this alarmed looking individual has been looking after me since childhood. Anyway, this is all just an excuse to share some faces that have been showing up in my work at the lab. It seems like stapled text blocks tend to spawn these creatures. They show up where old staples have torn the paper in the center of a signature. Good morning! What’s the plan for the day? No! Don’t use PVA on that mend! Hooray! Another beautiful day in the Preservation Lab! Does anyone else have any such friends to share?